How to snap object base on bottom object? Hey guys, I was able to drag n hold an vector/image onto another vector/image and an purple color indicator will flash once at the bottom object to indicate you can now snap your current selected image/vector base on the bottom vector/image. But now I can't, in not mastered in AD or any other illustrator app, so I not sure where to chance the setting to able it once again. Please help, it's urgently needed! 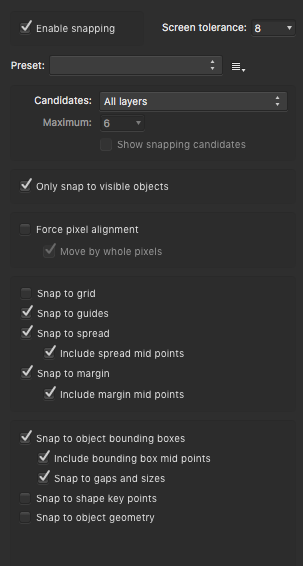 Go to the Snapping Manager... (menu View ▸ Snapping Manager...) and check Show Snapping Candidates. You must have Candidates List selected from the Candidates dropdown to be able to activate this option. wow so fast reply! thanks! Yeah I followed your steps, but it's not same as what used to be. It was like I drag a image/vector onto an image/vector, then the bottom image/vector will just flash ONCE only, the purple color won't show up again, then I can snap based on the bottom vector/image, other won't affected. with your step, every image/vector on my page is all "selected" in the purple color. I'm not sure why this happen, why it gone, I remember I didn't changed any setting, maybe update changed the setting? I can't remember how this happen! Thanks for the details. In that case uncheck Show Snapping Candidates (to hide the purple outlines). 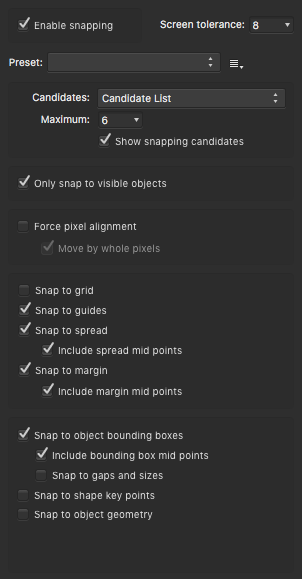 If it's not snapping it's probably because you have Snap to object bounding boxes disabled. Check it and let me know if it solved the issue. yeah, I checked it, but I think I also changed some other setting in here, can you guide me which other options need to enable and disable? Why this happen? Is the 1.5 update changed the setting? Hi MEB, i hope you still there, I manage to get it by play around with the setting, but when i get excited I found a problem, all my assets are grouped, when I hover over to the vector/image, the purple light flash on all image/vector in the group which is not I wanted, i only want one thing inside, and I set my max candidates to 6, it will count the whole group as 1 so total 6 group selected for snap! How do I solve this?